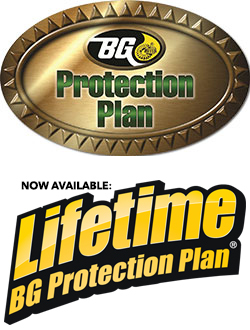 BG’s Protection Plans offer motorists a unique and free opportunity to gain peace of mind about the ongoing performance of their engine’s critical components, whilst saving them money and lowering emissions. If the vehicle has less than 50,000 miles prior to treatment with qualifying BG Products, BG will pay compensation up to £2,500* if the covered components fail during the service interval indicated in the plan, or during the next 12 months, whichever comes first. If the vehicle has less than 100,000 miles prior to treatment with qualifying BG Products, BG will pay compensation up to £1,250* if the covered components fail during the service interval indicated in the plan, or during the next 12 months, whichever comes first. Subject to repeated treatment every 12 months, coverage will continue to either 200,000 miles (with transferability to a new owner) or Lifetime Cover, where the cover can carry on for as long as the car remains with that owner. * Subject to terms and conditions. **Timing belts and damage to engine parts due to broken timing belts excluded. ***Grinding adjustments excluded.